Hope's Cafe: Mayfair Lane Whiteboard Review!! Mayfair Lane is a relative newcomer to the gift market world, but they have quickly become a top seller with their innovative products and fresh designs! The Happeez product line is made of simple, classic gifts that are uniquely stylish while also extremely practical. "Sue Russell, Mayfair Lane’s Founder and CEO, combined her finely tuned marketing skills with her constant search for the perfect gift. After working with 3M Post-it® products and elegant stationery lines from Boatman Geller, she made an important discovery. All notepads and decorative items for the refrigerator, even the most beautiful ones, were backed with magnetic strips. These strips worked for many households but not for those with a stainless steel, glass or wood paneled refrigerators, to which magnets do not stick. And so, Happeez® were born." I was allowed to choose an item to review. 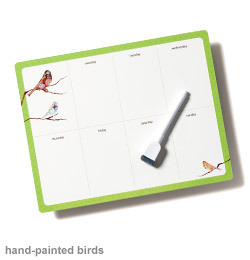 After browsing the variety of products, I picked the Whiteboard with the hand-painted birds design. I really liked the simple beauty of this design. The whiteboard is made of a revolutionary material that grips to slick surface including stainless steel refrigerators and doesn't leave any residue! You can stick this somewhere, and if you want to "hang" it somewhere else, that's no problem! Simply wipe the back with water, dry off, and place it wherever you want! I found this whiteboard really came in handy. It is so much easier than leaving sticky notes all over! Whether writing a shopping list, leaving a note for a family member, or jotting down an important phone number, this is a great tool! The whiteboard comes with a dry-erase marker (that also grips to slick surfaces). Unfortunately, my pen was dried out when I got it, but it was very easy to just grab another dry-erase pen. Mayfair Lane has many other great products for your home, including note pads, list pads, photo whiteboards, letter clippers and more! And there are so many fun designs to choose from! "Happeez® Notepads, Clippers, Photo Frames, Whiteboards, and List Pads contain a Happeez® material that grips to stainless steel and other slick surfaces such as glass, mirror, aluminum, plastic or vinyl. Unlike a magnet, Happeez® products protect surfaces from scratching and marring, and will not leave a residue. If the product loses its grip due to dust build-up, users can easily revive it by spraying the back with water or a vinegar-based window cleaner. In a short time, Mayfair Lane has made great strides. Our products can be found in over 1,200 retailers nationwide and in Canada. The response from both the traditional press and the online media has been resoundingly positive." So go check out Mayfair Lane today!